Hello AAMers! We are so excited to host you in just a few short weeks!!! Are you getting amped? Some things you should know … you might have heard some things about Texas recently on the news … wild fires , drought, record heat – it’s true, you should pack some extra deodorant and don’t forget your swim suit. Summer has hit our fair city early. And while we’re big fans of air conditioning here, we also still know how to enjoy patio happy hours even into the hot and humid hundreds. Answer: frozen drinks. Pack your sunscreen and seersucker and I’ll meet you on the patio. Just remember: brain freezes are no fun … drink slow. I have to agree with the two or three friends who nominated Volcano – it’s always a place I take out-of-town guests. It has character – think eclectic tiki Island with attitude – it also has a great enclosed back patio as well as covered front patio. Keeping with the theme – get the frozen Cuba Libre [rum & coke]. It’s like the adult coke icee. Also worth mentioning the [not frozen but extremely wonderful] Strawberry Basil Margarita and what I will nominate as the best Bloody Mary in Houston. Speaking of frozen mojitos….I’m so glad someone else nominated Boheme for their version of this yummy concoction. I’ve written about Boheme previously on this blog for their wine. It would seem a bit biased if I sang their accolades again. But hey, when you’ve got it, you’ve got it! 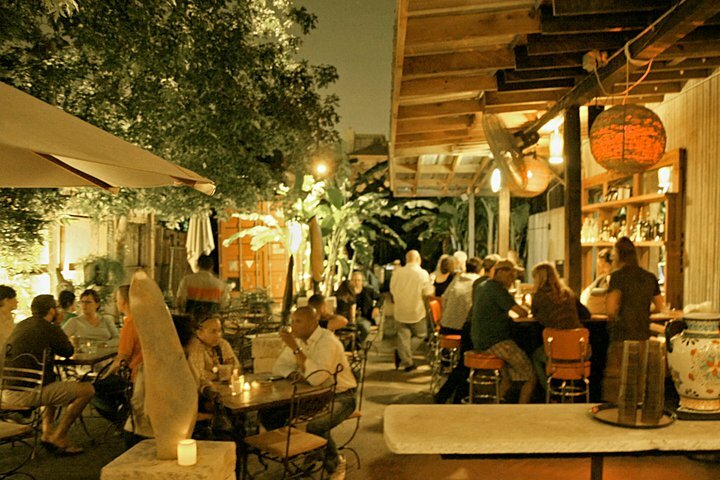 They’ve recently expanded their back patio and noshing menu, too. Their walls boast work from local artists, the playlist is run by the bartender’s Pandora preference … it’s your local neighborhood coffee, wine & more spot. Throw caution to the wind at this Midtown staple. 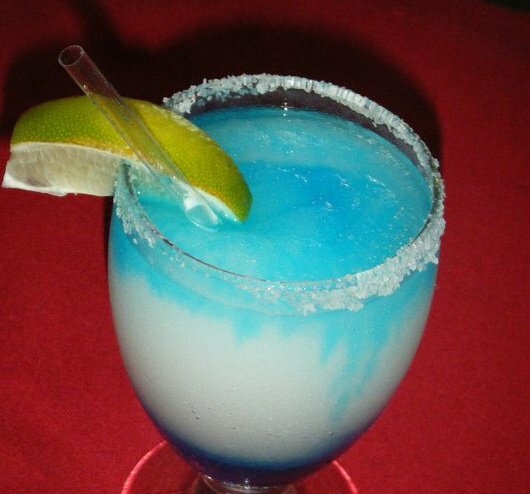 In the words of my Facebook friend on her El Patio frozen ‘rita nomination … “It’s a one-two punch. One, you’re woozy, two, you’re out. Plus, they’re tasty and cheap.” El Patio is festive – music is always playing … and so are the mariachis. 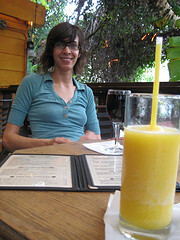 While my first choice is not always a margarita (I know, I know … I’m going to have my Texan card revoked), it is my first choice at El Tiempo – their frozen sangria swirl margarita is, as they say, “The Bomb” … but as with El Patio, Texan margaritas are not for the faint – one you’re good, two you’re down. I discovered Little Woodrow’s frozen mimosas by sheer accident. On a day when a friend and I were off from work and craving a patio and some cerveza , we hit the brakes driving by Woodrow’s and thought – that’ll work. We spent the next three hours catching up and catching some rays while the rest of the world worked away. It was a mini-vacation. And while it started as a “oh, let’s try that frozen drink in the machine,” once we started on the mimosas, they flowed freely the rest of the afternoon. Mam’s is not a bar, nor do they sell alcoholic beverages. They will keep you cool and keep with the frozen theme. Mam’s is a local fave serving “New Orlean’s Style Snoballs” – it’s a local legend. This is not your typical crunchy sno-cone, Mam’s are soft fluffy snowballs complete with 50 flavors … yes, even Tiger’s Blood. They’re usually stationed in the Heights but keep an eye on their twitter and Facebook for hours and location updates. So there you have it….my Facebook family’s list of must-sip chilly libations to melt away the day. I hope you’ll find some time to check some out. 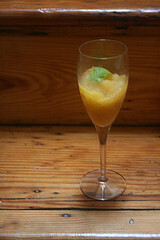 Houstonians – any other suggestions to share with our AAM friends on the best frozen finds in our city? Comment below and let us know! This entry was posted in Drink, Places of Interest. Bookmark the permalink. Love it, thanks! Canyon Creek has frozen mimosas – not just on Sundays. mmmm, after a workout at memorial park this summer – highly recommend it with the no name chicken sandwich.